Television season finales have become weirdly tense affairs, tasked with providing both satisfying narrative closure and unexpected twists. But it’s safe to say that no one will ever stick the landing like director Andrew Jarecki did on HBO’s true crime drama The Jinx: The Life and Deaths of Robert Durst tonight. 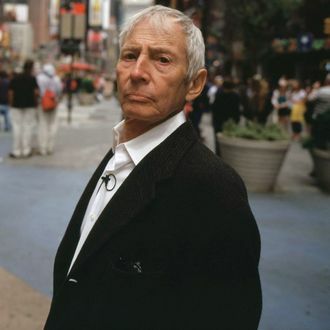 After five episodes detailing three murders that big-time real-estate scion Robert Durst either committed or was extremely unlucky to be in the vicinity of, Durst incriminated himself on-camera — or, rather, on the live microphone he wore to the bathroom after his final interview with Jarecki ended. The big moment had been set up in the previous episode, when Jarecki found evidence that seemed to tie Durst to the death of his old friend Susan Berman in 2000, but even he could not have hoped for a more shocking ending. After all, Durst — who reached out to Jarecki to do the series after he saw the director’s 2010 film All Good Things, which was based on his life — seemed to have effectively bluffed his way through five episodes closely examining the murders of his ex-wife, close friend, and neighbor. Even if it seemed obvious that he was responsible for the crimes, he still couldn’t be tied directly to them (except for the neighbor he admitted to dismembering, that is — but Durst insisted that he did that only after killing the man in self-defense, and a Texas jury believed him and set him free). 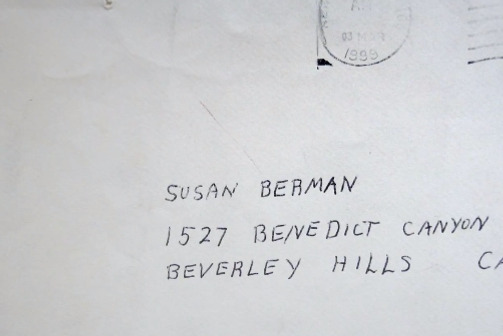 The handwriting on this letter from Durst to Berman matched the writing on a note sent to the LAPD, directing them to Berman’s body. But although Durst — whose nervous blinking and odd facial tics were a constant feature of his interviews throughout the series — denied all knowledge, he seemed rattled at one point, putting his face in his hands and making an odd burping sound. The interview ended, seemingly anti-climactically. The crew started to pack up, and Jarecki offered Durst a sandwich. Then Durst made his fateful trip to the bathroom, where his muttered monologue included the words “What the hell did I do? Killed them all, of course” and “That’s it. You’re caught.” According to the Times, it took Jarecki more than two years after the interview took place to find the audio. Unbelievably, it was the second time Durst had been caught on a hot mike. In an earlier episode, he appeared to be rehearsing his lines during a camera break, until one of his lawyers came over to warn him. But then, the series depicted him more as a rich, entitled, anti-social oddball than a criminal mastermind — he committed clumsy errors at various points over the years, and escaped jail time via a mixture of police negligence, expensive lawyers, and a credulous jury. Will Durst finally wind up behind bars now? Whether his confession will be admissible in court is still an open question. (The audio was captured in the bathroom, where the Times’ legal experts say Durst had reasonable expectation of privacy, and his attorney told Fox News that he was “underwhelmed” by the confession.) After watching The Jinx, it doesn’t seem impossible that he could get away with it again.